This raw Apple Banana Cinnamon Cereal is a tasty, fast and easy to make breakfast which I prepare when I have run out of fresh ingredients to make my morning smoothie or when I am travelling. It is quick to make and it is a nutrient-dense, balanced meal. It’s rich in fiber, essential fatty acids and protein. It’s something I live on when I am travelling and don’t have access to my blender. It contains everything you need and gives you lots of power and energy for your day. In this raw cereal I have used pumpkin seeds, sesame seeds, hemp seed, ground flax seeds and almonds but you can use any nuts or seeds you like. 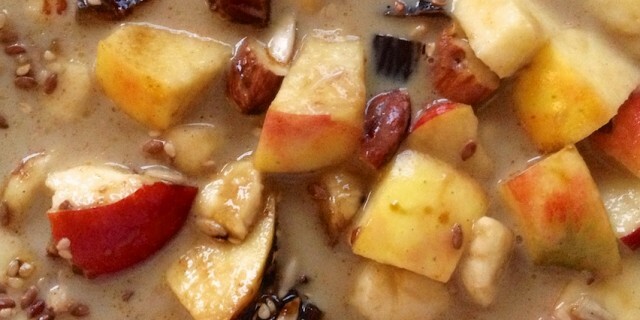 I love adding dates for extra energy and I always add some fresh fruit. Depending on where you are in the world, you can add any fresh fruit you like. Bananas and apples are usually available anywhere I travel to but, if you can, go for something local and seasonal. Feel free to experiment with any ingredients you like. This super easy and fast nutrient-dense Apple Banana Cinnamon Cereal is a great way to start your day! Mix all ingredients in a bowl and top off with almond milk.